Nature offers an abundance of medicinal plants, botanicals, and herbal remedies. But the pickings can become a little slim during the winter, unless you know where to look. Of course, you can still find bright, red rose hips — the seed pods of wild roses — flourishing during the winter. 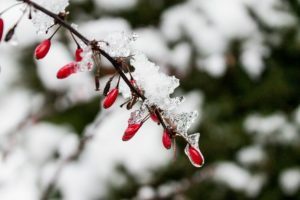 They stand out beautifully on stark, bare rose bush branches — and especially against the contrast of a white blanket of snow. It will be well worth the effort to trek into the cold this season to find wild-growing rose hips, as they contain very high levels of vitamin C. In fact, rose hip preparations are the single-most potent sources of vitamin C occurring in Nature. And in olden times, when people couldn’t get “greens” during the cold, winter months, they got their vitamin C by gathering rose hips in the wild and adding them to foods and beverages. In addition, other studies show one of the flavonoids in rose hips reverses liver toxicity and suppresses fat accumulation in the liver. In one clinical study, obese individuals ingested 40 grams per day of rose hip powder for six weeks. As a result, this reduced the patients’ blood pressure and blood lipids (fats), and improved their overall heart health profile. Rose hips also have antioxidant, immune-supporting, and anti-cancer activities. And research shows they further benefit arthritis, depression, kidney stones, liver disease, and skin conditions. Today, you can still find wild rose bushes growing on the borders of winter woods, hedgerows, woodland tracts, and sometimes even backyards. Gently gather the hips to make use of them later. When you get home, lay the hips out to dry on a mesh screen, or keep in a dry paper bag in the sun. Shake every few hours for the first day. After a few days, they will be dried out and ready for storage. Once dried, keep in glass jars with metal screw tops and keep away from direct sunlight. You can then add the dried hips to any tea, jam, or dessert. To do so, first cook and strain out the seeds with a colander. You can also use them to make a jam by adding honey, dates, and spices to taste. If you don’t have the time or opportunity to collect your own wild rose hips, look for dried, powdered rose hips as a dietary supplement. I recommend 1,000 mg (or one gram) per day. This amount borders on a food quantity — so you may find it more convenient to use in a water-soluble powder, which can be added to any beverage of your choice.